While coming to terms with her father’s illness, Tamsin seeks escape in a nearby wood. Alone, consumed by problems at home and at school, Tam’s rage leads to an amazing discovery: she can fly. Fear quickly turns to exhilaration as Tam explores her strange new ability in the magical surroundings of the wood. But she soon realises it’s a secret too big to keep to herself and the only person she can turn to is Abigail – a girl from school who she used to bully. As her secret friendship blossoms and Tam learns to control her strange gift, her oldest friend, Becca, becomes more and more isolated. Tam’s secret grows harder to conceal and the bonds of friendship begin to unravel, starting a chain of events that could lead to tragedy. 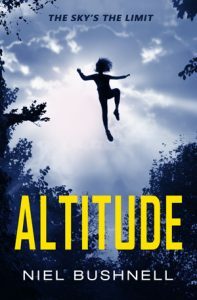 Altitude is a moving story of friendship between three very different girls taking their first steps into adulthood. It’s about leaving the past behind and becoming the person you want to be.